does the chart mean to include 'h' as a voiced consonant, or is the bottom row unspecified for voicing? For many English speakers, /h/ is voiced in words like 'ahead'. Variation occurs. I note how Carl Sagan pronounced 'human' without an /h/ or as if the /h/ was voiced and it disturbed me. :o) But still, I wouldn't label English /h/ voiced by default. There are a quite a few problems with that graphic, methinks. How are we supposed to say 'eat crow' with a limited diphthong inventory like that? Since when is h voiced?! i've always heard carl sagan's "yuman" as the common deletion of /h/ before /j/. i'm not familiar with the voiced variation in 'ahead'. in 'greenhouse' (mentioned on the linked page) perhaps it's voicing that i've more broadly transcribed as a deleted /h/. these may be allophonic voicing, but /h/ is just as voiceless as /t/ regardless of some phonetic representations. I find that in words like "ahead" and "greenhouse" the /h/ is voiced only in allegro speech (Roach's unqualified claim in the linked excerpt that it is _always_ voiced in such words seems far too strong to me). I hear "human" as /'jumən/ constantly on the NPR news (US public radio, rough equivalent of BBC). Some years ago, my wife co-authored a Russian textbook for a highly reputable, nay academic publisher. As the native speaker of the team, it fell to her to proof-read the Cyrillic. Despite their eminence, they never once processed her corrections without introducing new errors. "I assume the bottom row is intended to be unspecified for roundedness." I don’t see the problem either. Not only is the bottom row intended to be unspecified for voicing, it IS unspecified for voicing, and for voicelessness too! It is not specified as anything, except as "other consonants" in the correct chart JW refers to. And it should not be specified for either of these features: the phonemes in question are phonologically unmarked for either, since both features are not distinctive for them, and these phonemes may in fact be realized with eitherphonetic feature, hence the (I agree relatively restricted to allegro) voiced allophone of /h/ and voiceless allophones of the others, such as [ç] in human, with or without the [h], the psilotic version being a free allomorph and nothing to do with allophony. ɑʊ is indeed replaced by aʊ on the correct chart which you can click for the sound files, in which it tends more to a fronted allophone and aɪ if anything to a backed one. So John, if /aɪ/ tends to [ɑɪ] and /aʊ/ tends to [æʊ] (think of the young princes of Wales, or especially David Cameron), why do you think ɑʊ rather than aʊ "could perhaps even be defended as a preferable notation for the diphthong in question"? Don't they also miss the vowels /ɛ/ and /ɛː/ ? mallamb, concerning Mr Cameron, isn't that quite a normal diphthong he has? Maybe it sounds more profiled because of the contrast with his other vowels; his artikulationsbasis seems to be rather back and rounded and he seems to protrude his chin a bit. It does seem quite normal for such youngsters not too long out of Eton. He fronts the rest of the diphthong quite a bit as well. I suppose it's not beyond the pale to describe congential prognathy as an artikulationsbasis! (3) δ (small Greek delta, U+03B4) for ð (U+00F0), voiced dental fricative. And of course some people will use the capital forms, e.g. Ʌ for ʌ, etc. All of these, of course, mentioned on John's help page. Ahven - /ɛ/ is replaced by /e/ in that table (which is also how John Wells writes it). In word-processed text, there's no excuse for mixing up characters with distinct unicode points. Otherwise, one tends to exaggerate the distinctive features to aid discrimination. But then, cursive script often departs from type glyphs. army1987: Two that do are Courier New and Gentium. Phoneticians also potentially need to distinguish both of these from the labiodental approximant symbol ʋ (curly v, U+028B LATIN SMALL LETTER V WITH HOOK). @John Wells: In Gentium 1.02, at least on my Mac, v and ν are distinctive in roman but are only barely distinguishable in italic. In America, I wouldn't call the deletion of /h/ before /j/ common. However, it is common in the New York City area, the Philadelphia area and New Jersey. Guess where Carl Sagan is from? Brooklyn. So that explains why he has that feature. Change "is from" to "was from" in previous post. Also change "has that" to "had that". Sorry astrophysicists. Also I didn't think that pronouncing /aɪ/ as [ɑɪ] and /aʊ/ as [æʊ], i.e., PRICE-MOUTH crossover in Wells' terminology, was a feature of RP. Is it now? Surely David Cameron speaks RP. He did attend Eton and Oxford after all. Sorry if I'm oversimplifying things. Anon, I'm sure you're right about the PRICE-MOUTH crossover. It sounds very non-RP to me. But of course David Cameron speaks RP. I did mention he was "not long out of Eton", and meant by that to imply his relative youth, not that he didn't speak RP. His /aʊ/ is not [æʊ], but something far more exotic, which I made a stab at describing. It is definitely fronted though, and it is my impression that it can be heard to varying degrees from Etonians of his age and younger. I was actually talking about the sound files on the BBC page JW was discussing, where the /aʊ/ did sound non-RP to me. 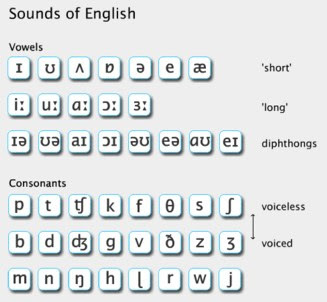 BTW I see that re the bottom line of the table in question, I said above "these phonemes may in fact be realized with either phonetic feature, hence the (I agree relatively restricted to allegro) voiced allophone of /h/ and voiceless allophones of the others, such as [ç] in human, with or without the [h], the psilotic version being a free allomorph and nothing to do with allophony." I don’t know how I could have expected anyone to understand that. I would like to think that what I said about Cameron was not of the same degree of opacity! The [ç] in human may of course be a voiceless allophone of /j/, as in [hçuːmən] with the [h], but without it, as in [çuːmən] it is an allophonic amalgamation, which some of you would probably call pseudo-elision. After that the sentence appears to subside into gibberish, but by the psilotic version I meant the one with no h in any sense, i.e. neither /hjuːmən/ nor [hjuːmən], which are respectively a phonological impossibility and a phonetic impossibility for the whole set of such forms in the dialects and idiolects in question. So its non-appearance is nothing to do with allophony, as there is no /h/ phoneme there to have an allophone! Anyone who calls it a zero allophone is mixing phonetics up with morphology, which is the study of phonological forms, not phonetic forms. I am not of course speaking to inveterate level-mixers like TG-ers! So /juːmən/ (not [juːmən]) is a free allomorph in the overall system of English, and I could imagine also in the individual speech of some people, if they for example do have the initial h in a different register. Anyone agree? If any contributor here does use both forms, I would defer to their informed sense of whether for them it is in fact a case of allomorphy or for them the word definitely has the phonological identity /hjuːmən/ and they have an optional zero allophone for the /h/. If you are seeking for further amusement, in Ulster a human being can be a [ʃʉmən bin], a [kçʉmən bin], or a [θçʉmən bin]. I am very confident that most of the Americans who pronounce "human" as /juːmən/ would still pronounce the name of the largest city in Texas as /hjuːstən/. Psilotic it is, vp! The /juːmən/, that is - in clearly apsilotic dialects, of course! Thanks 1m. I would have twigged the non-attestation of /juːstən/ if I had thought of it, but I can't think of everything! So just to recap, in such dialects and idiolects at least, /juːmən/ and /hjuːstən/ are the correct phonological forms, /hjuː/ and [hjuː] are not respectively a phonological or phonetic impossibility, and quite irrespective of whether they also have /hjuːmən/ or not, there is no /h/ in the /juːmən/ for zero to be an allophone of, because even if they do have /hjuːmən/, /juːmən/ and /hjuːmən/ are free variants of the phonological form of the Expression, and therefore free allomorphs. You don't say whether these or any people do use both those forms for 'human', but you have already corroborated the allomorph hypothesis, and I would no longer defer to their introspections if they insisted the word definitely has the phonological identity /hjuːmən/ and they have an optional zero allophone for the /h/. For then why would they not have that optional allophone in 'Houston'? I am being a descriptivist here, not a psycholinguistician or some sort of TG-type wannabe neurolinguistician. It is morphology, not phonetics that has to take account of sign identity. I do wish I were better at beating a path so that people don't get lost! But it is a jungle. Have I found you now? I think I know what you mean about David Cameron's MOUTH now. When he says "Downing Street" it sounds almost like "Dining Street" to my ears. The second element sounds fronted. It kind of reminds me of how James May from Top Gear pronounces MOUTH. Some Americans actually do say /ju:stn/ (it won't let me paste the schwa in for some reason). I think it's the same ones who drop the /h/ in "human". I also heard that Houstonians pronounce it that way too. Actually I think James May's MOUTH is rather different than Cameron's, but nonetheless equally exotic to my ears. Some Americans may drop the "h" in "Houston", but there are definitely many who retain it even though they drop it in "human", "huge" etc. FWIW my wife, who is a Houston native, doesn't drop "h"s in any of these words. I don't doubt Anon's satatement that some Americans actually do say /ju:stn/, especially Houstonians, and I never did. Neither do I doubt that like your wife (it's nice that she is a Houstonian!) many have /hju:/ for all these words. That even more obviously puts the opposition h~0̸ beyond dispute, since there are plenty of words with initial /ju:/ with no possiblity of an /h/ phonological, phonetic, or orthographic! The main corroboration for my allomorph hypothesis is your statement "most of the Americans who pronounce "human" as /juːmən/ would still pronounce the name of the largest city in Texas as /hjuːstən/." Wow amazing!Words can really create a magic.And here it has proved its power.Ne ways i will keep looking around for more information. But the Cambridge English Dictionary uses [ɑʊ]?